After reading my students’ reflections on their blogging experience I felt like my assignment had taken multiple swigs of the Polyjuice Potion from Harry Potter. 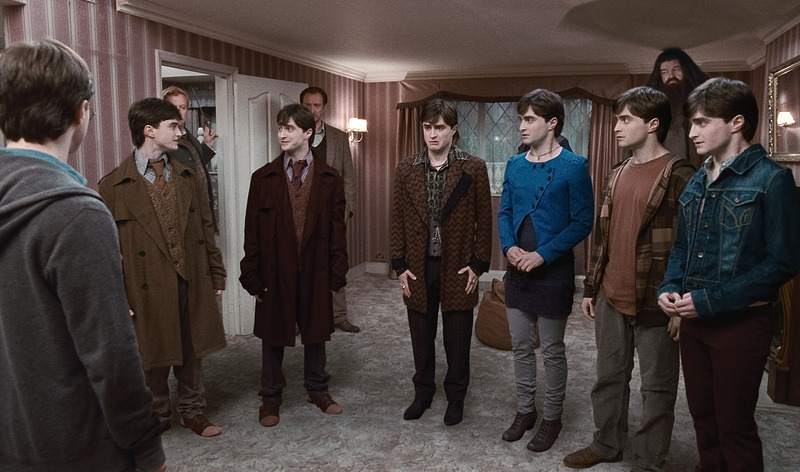 If two or more people swallow some Polyjuice potion they can all look like the same person, even though they are not. Student 2: “I found it very difficult and limiting to be forced to write about things that I didn’t want to write about. It made me do a double-take. Of course it feels like a simple task, to me, to connect two things that seem so different that they can’t possibly be linked. I wrote about the power of this approach in my post on why we should replace close reading with connected reading and in my post on the power of FM writing. 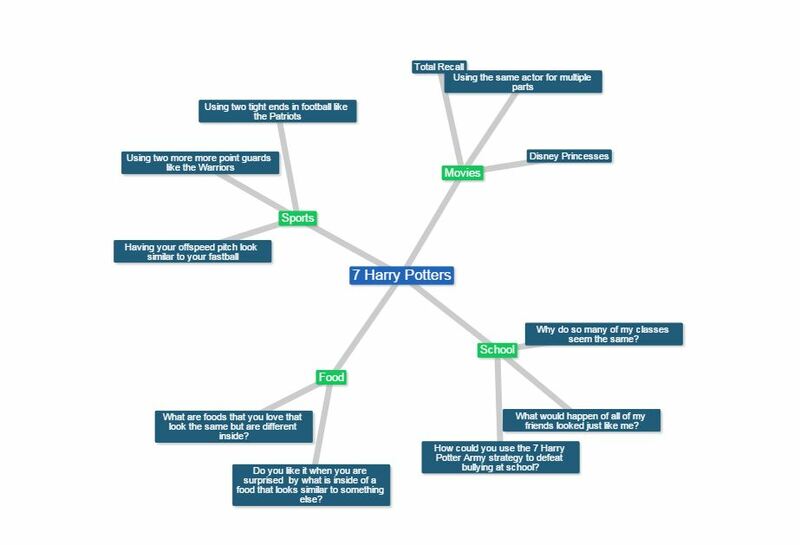 For example, what if I told a student that they had to include the idea of seven Harry Potters in a blog post but they weren’t interested in Harry Potter. Perhaps they are only interested in sports, other movies, food, or school. Well, it’s really quite possible to make those connections. Just look below. But let’s say it’s not so simple, let’s say that the challenge of having to address specific content in your writing is a gosh darn constraint. And everyone knows that constraints KILL creativity right? Creativity CRAVES constraint because a constraint is a connection and nothing can be created when there are no connections. Constraints FORCE connections, and connecting is a good thing- we crave it. Schema is how we organize our world from day one. Besides time, constraints can be tool based. Will Turnage, VP of Technology and Invention at digital advertising agency R/GA, starts many of their design and innovation projects with a tool-based constraint and firmly believes that constraints are essential to creativity. So let’s see this in action. 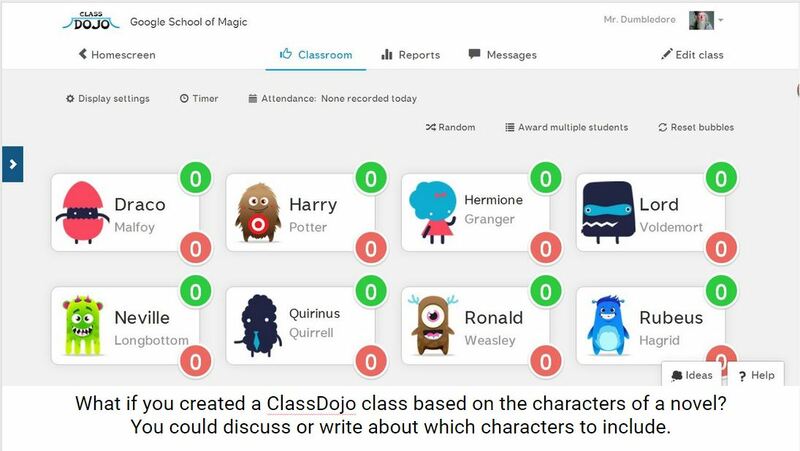 In a nutshell ClassDojo is a teacher app where you can assign “points” for positive and negative behaviors in your class and then assign each student in your class a particular visual monster. When a student does something well his monster gets positive points. Usually teachers have the class of monsters on a large digital projection screen so that the kids can see the points they are getting in real time and modify their behavior accordingly. My brother-in-law actually used it with a high school class in New Zealand and loved it. But that’s not how we are going to use it today. 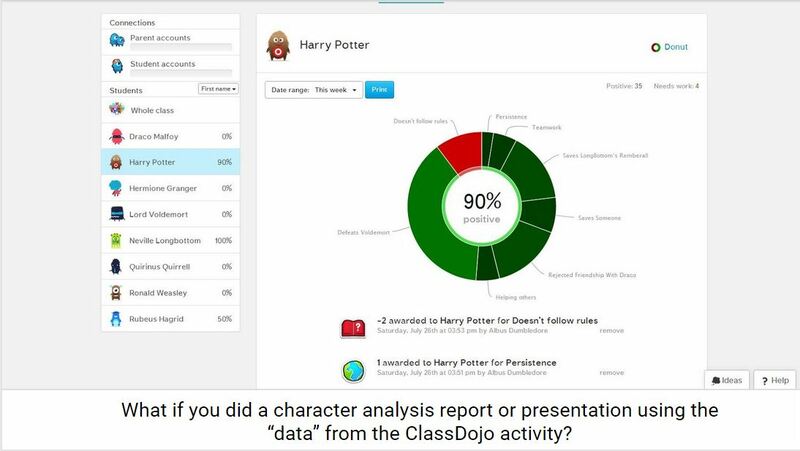 We are going to do character analysis and ethical analysis and discussion using ClassDojo. So the first thing you are going to do is sign up for ClassDojo and then create an account. Mr. Dumbledore is teaching this class. It would be interesting if Snape or other famous Potter teachers were handing out points. Use a character list and populate the class. 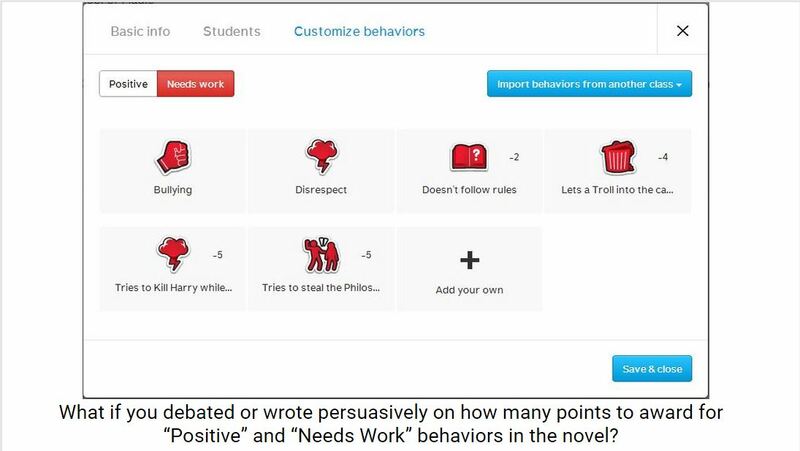 As you read add “Positive” and “Needs Work” behavior items whenever a character does something of note. You can discuss how many points you would give each item. You could even read famous philosophers and use their essays on ethics to inform your decisions. Heck the philosopher could be the class teacher and you could run multiple Potter classes in groups. Each group assigns points based on the ethical beliefs of a famous philosopher and then compare the results. 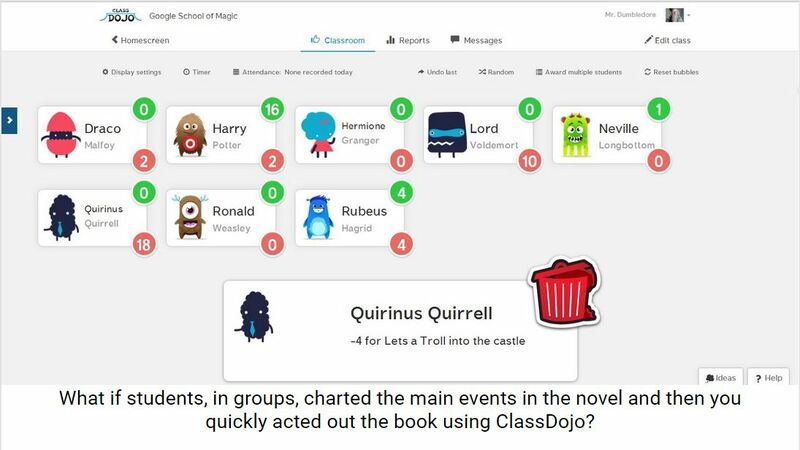 How fun would it be to have the ClassDojo class up during an in class read and then see the points pop up and down while you read. You could even let different students or pairs of students control the point giving and then explain their choices after the reading. This part is super interesting and has tons of possibilities. 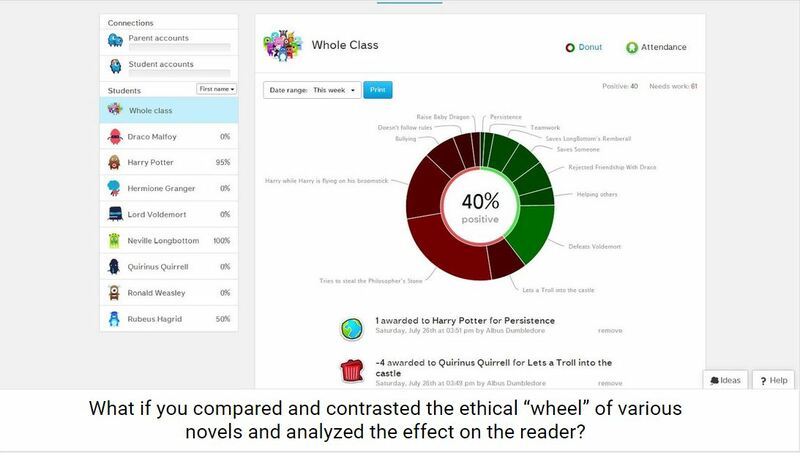 You could have students write or present an analysis of characters based on their overall “ethical wheel.” You could even have students do this with outside reading books as an option for a book report. Do you notice this last image? It’s an ethical wheel of the whole “class.” Basically it’s an ethical analysis of every major character. What if you had an AP class use this method to compare and contrast the ethical makeup of various books you read throughout the year and then they analyzed which books they liked the most and whether the class likes books that are more ethical or unethical and why? Imagine a whole ClassDojo class built of famous people from one side of World War I and the analysis that would come out of that? Imagine a math class trying to figure reverse engineer the final ethical wheel if you left out key stats. Or what if they came up with formulas to determine the value of common behaviors in their own life? Imagine a PE class watching video clips from various sporting events and determining the ethical wheel and values of what they see during games? All of this imagining came out of being “constrained” to using ClassDojo as a learning tool instead of just a motivational tool. 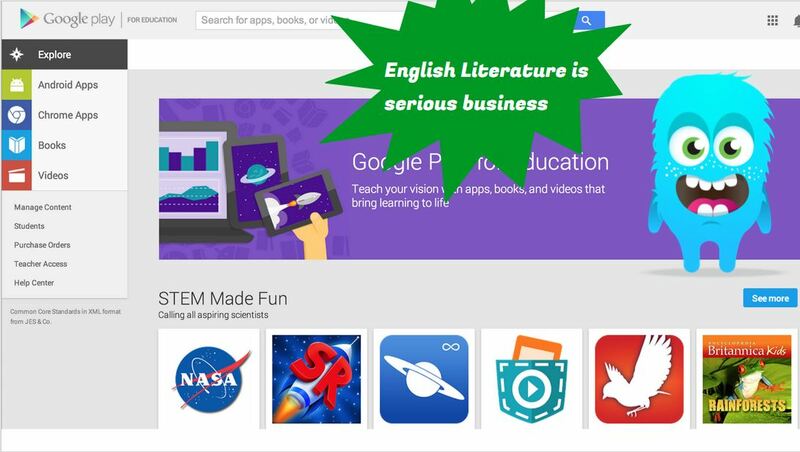 Imagine how many other possibilities exist in a place like the Google App Store For Education. 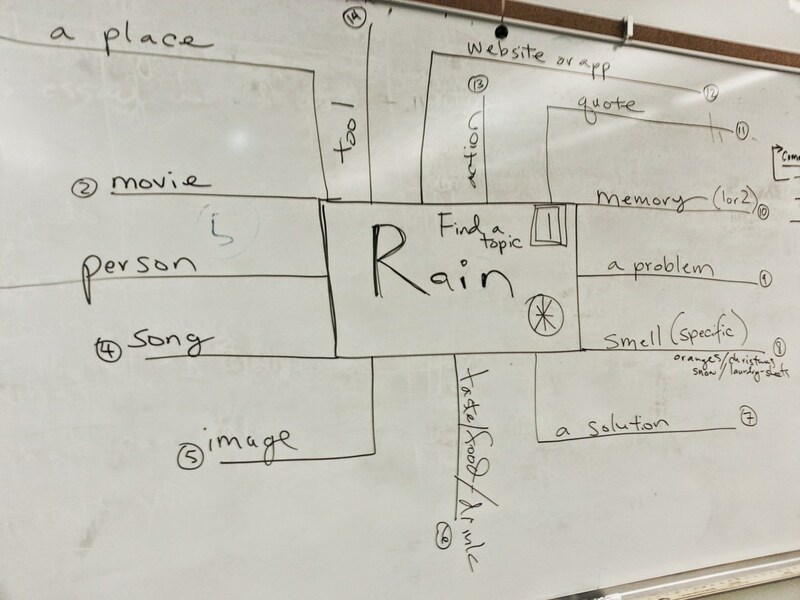 Imagine giving your staff a choice of five programs and then having them brainstorm unconventional ways to use those programs in the classroom as a PD activity and then sharing those ways with their peers. This is all very similar to what Jon Corippo and others calls an Iron Chef lesson plan. When you force everyone to use a certain element in their creation. For example what if every student had to use a picture of something eating as a slide in their presentation? You might get some pretty interesting takes. You could get animals eating, animation characters eating, bugs eating, a giant whirlpool, or just this. You could even do a version of the TV show Chopped by giving your students or your Professional Development groups a “basket” of three ingredients they HAVE to use in their creation. Please feel free to share your own creative constraints below. Thanks. Posted in Activities, Creativity, Fun, Google Apps, Google Play, Learning, PD, Pedagogy, Professional Development, tech tools, TechnologyTagged 99u, Brainstorming, Brainstorming 101, Brainstorming Basics, chopped, ClassDojo, constraints, creativity, cutthroat kitchen, Damien Correll, David Theriault, Dumbledore, Edtech, Ethics, Fun Classroom Activities, Google, Google Play For Education Ideas, Harry Potter, Iron Chef, Learning, PD, Pedagogy, Philosophy, Polyjuice Potion, Professional Development, School, Snape, Tech Tools, Will TurnageBookmark the permalink. Really interesting stuff! I’ve believed this about constraints for a long time. In my own experience writing poems, for example, having to follow the arbitrary rules of a form and rhyme scheme forces you to reach a little further to express yourself. I end up expressing ideas I didn’t even know I think sometimes, and I wouldn’t have been as creative if I just wrote freely. Another teacher I spoke to the other day gave the example of leading a group of strangers to the edge of a cliff…they will all huddle close to each other away from the edge so as not to fall. If you build a barrier between them and their death, they will look right over the edge, some even craning their necks to see as much as possible. That’s a memorable metaphor. Thank you. We read” Peter Pan” during a Coming of Age themed unit and I love that Class Dojo idea! I am going to have the class come up with character traits of a “grown up” for the positives and character traits that are “child like” for the negatives and have them assign points so that we can see which character behaves in a more grown-up fashion. I hope when I grow up I can be as awesomely creative as you are. Thanks for sharing this. Actually, i think maybe the grown up ones should be the negatives. Child like behavior is more positive now that I’m really thinking about it.